If you care for your new towels right, they'll keep you and your kids wrapped in post-bubble-bath softness and comfort for at least five years. And they'll look color correct, too. That's right, a good-quality towel, properly laundered, can arrive with your newborn and stick around until he starts kindergarten and look little worse for wear. Here's how to wash towels to keep them soft and absorbent for years to come. Don't just put that new towel on the bathroom hook or towel bar! Get it primed for softness and absorbency before the first use. Many manufacturers add a finish that creates a sleek, soft feel, but in truth this actually diminishes the towel's absorbency. While these chemicals will rinse out with a few washes, you're often left with a scratchy, rough towel. To get the fluffiness and absorbency you crave, first soak or wash towels in cold water without detergent or fabric softener. Then tumble dry low. And only then, into the bathroom they go! Always wash towels separately from the rest of your laundry. This is both for the towels' longevity and that of your family's clothes. 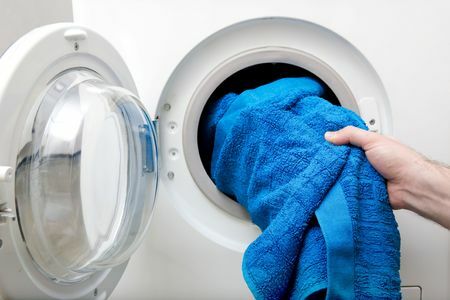 Towels can cover co-washed clothes with lint. And clothes with zippers, hooks, and buttons can pull loops out of terrycloth towels and snag others. Further separate dark-colored towels from their lighter cousins. This will keep both the light and dark colors intact. If the fiber wears best in cool-water washings, the label will tell you this. Otherwise, warm is best. Extra-hot water can fade colors and reduce the softness the kids love. (And hey, who are we kidding here? Moms and Dads love it, too! Unless the towel or washcloth has come into contact with an ill family member (thereby requiring a stronger laundry detergent and possibly chlorine bleach), choose a gentle laundry detergent to protect both the fibers and the color during weekly washings. Use only half the recommended amount of laundry detergent to keep towels absorbent and soft. Wash towels at least once a week, every three to four days if needed. Wash towel sets together so any color fading is uniform. Tumble-dry towels on a low setting and remove the towels while they're still slightly damp. Excessive heat wears down towel fibers. If they're hot (not warm) to the touch coming out of the dryer, you've overdried them. Some fabric softeners contain water-repellent silicone, the death knell for towel absorbency. So skip the fabric softeners when drying a load of towels. Between bathing, hang towels loosely on a towel rod or on bathroom towel hooks to allow quicker drying. This will help keep mold at bay, meaning your towels stay fresh longer and need fewer washings (a double plus: less work for you and less machine time for the towels).